Thank you Elaine for stitching the majority of these sweet maids for me, which gave me time to be working on the next project. And it seems there is always a next project! I have been remiss: I always forget to give you Elaine's blog details. Well, you can find her here. We know her as Lanybleu ( I even spelt that wrong in the last post...sorry Elaine). Poor Elaine has to deal with my colour melt-downs and sudden changes. But she takes them in good grace and I hardly ever have burning ears. THANK YOU Elaine from the bottom of my heart. I now have proof of some creativity to leave my children which is what it is all about. I am also pleased to say that my charts have begun to sell. I keep the prices down not because I don't give them any value, but because I value you guys. I know what a tough time a lot of you are having right now. And of course donations from each one to go one of my cancer charities. Well, they are all home now. I am pleased to say we have started to paint the living room which means hopefully we can stop living in the kitchen soon! And when it is all finished, the maids will be hung up near the French Marble fireplace which inspired them. Boo-tiful in Black isn't here...She refuses to come out during day-light hours! Pretty in Pink is the first and probably my favourite. She is a simple soul, very 'Jane-Eyre-ish' in character. A gentle, kind person with a big heart. Then came Boo-tiful in Black. I stitched this one: she now sits in my Needlework book quite happily surrounded by spider webs and spiders. The Victorian's loved Halloween really, which we don't realise. Dracula and Frankenstein's Monster were victorian creations and in an age when pretty young ladies were chaperoned and expected to behave, giggling in fear when reading novels together would be the same as our teens sneaking into the cinema underage to see a horror film! Little miss Graceful in Green: pure socialite and thrives in public situations. She loves to be centre of attention and is always dressed to the nines: She tells me that young ladies need be prepared for all social and public situations at all times and one should always look ones best! Next came Perfect in Primrose...and boy was she a perfectionist. But she is happy now, especially since we have finally got a picture which shows her at her best. Taking the photo involved a non-eco friendly light bulb (we were going to save it until they became collectors items and then sell it ebay haha): a daylight lamp and a camera flash, and me balancing precariously on my bed hoping my dressing gown didnt dangle in the way while hubby laughed, hoping I would fall...lovely. I bet other designers don't impart so much 'character' into their work! But here she is with her frills and puffy sleeves, enjoying a summers day. And finally the stunning Bonny in Blue. A real animal lover and twitcher. She uses her fan to bashfully hide her face when she is the centre of attention, or so she would have you believe. In reality she is hiding the fact that she has spotted a bird of interest and is concentrating on that rather than on the party with whom she is conversing! Bonny and Perfect were stitched on Ivory Laguna ...it was the same fabric and as you can see from the changes here between the two, our light really is non-existant in Winter. I have two more xmas charts to reveal, as soon as I have stitched them and then A Maid for All Seasons begins....and I am so excited about these because they will be designed in a collaboration between myself and a well known producer! They all have their own charm, lovely! A cute set of ladies! A super collection. I think Bonny in Blue is my favourite, she looks a nice young lady with her little doggy. That's quite a set! 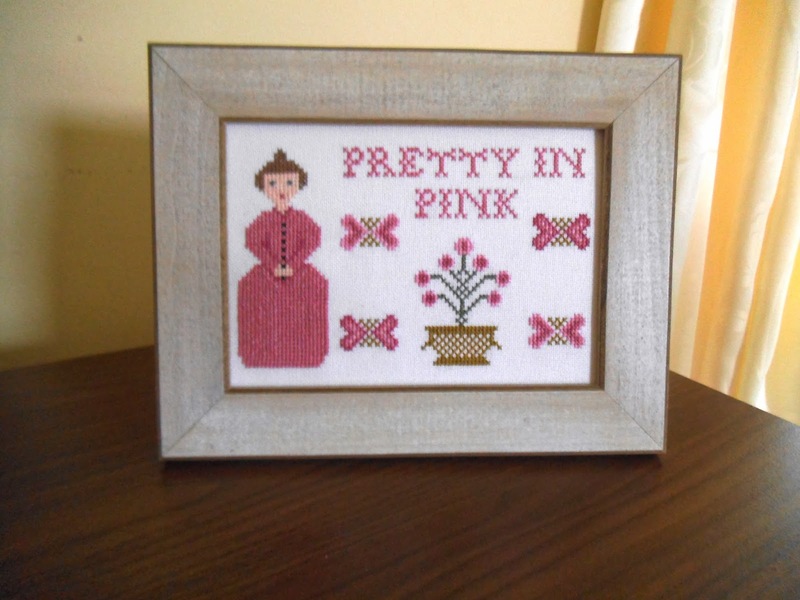 Pretty in Pink is my fave also! Hugs! Your welcome they were fun to stitch and will look great in your newly decorated room. Stupid question for you - are all the gorgeous ladies the same stitch count or do they vary? Just thinking they would look lovely if I stitched them on one piece of fabric.